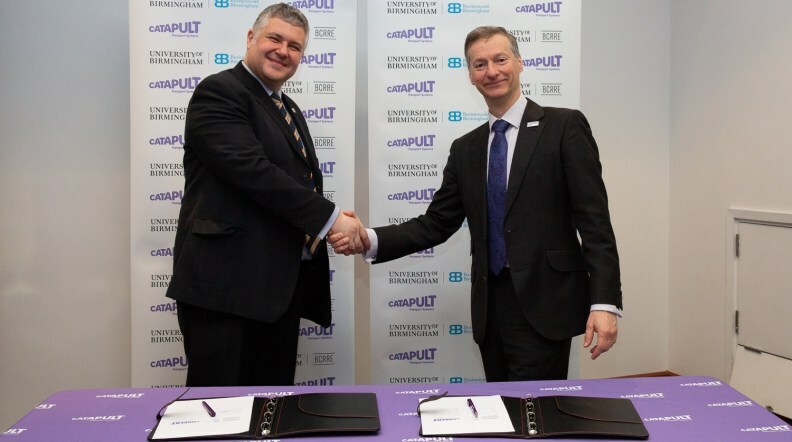 The University of Birmingham has signed a Deep Academic Alliance agreement with the Transport Systems Catapult, marking the start of a three-year strategic collaboration aimed at developing and implementing intelligent transport solutions in the UK. Launched in 2017, the Deep Academic Alliance programme creates strategic partnerships between the Catapult and universities that are playing a leading role in the fast-growing Intelligent Mobility sector – projected to be worth £1.4 trillion a year by 2030. The programme is designed to help universities more closely align their transport-related research with commercial opportunities and the needs of industry and government. The agreement was formally signed on Tuesday at the Rail Industry Association’s annual Innovation Conference in Telford by Prof Clive Roberts and Paul Campion. The agreement with the University of Birmingham follows on from the Deep Academic Alliances that the Transport Systems Catapult formed last year with University of Leeds, University of Nottingham and Cranfield University.